The seal is the official symbol of the university. As described in the University Articles of Incorporation, the seal is a circular shield inside which is inscribed the philosophy of the University of the Visayas: Amor, Servitum Humanitas (Love and Service to Humanity) and the year 1919, the year of its founding. At the center of the seal is the shrine of the Magellan’s cross, typifying the Cristian ideals which inspired the founding of the University, against a background symbolic of Philippine communities to portray the leadership development areas which the University had envisioned to serve at the time of its founding. An open book and the torch of knowledge represent the ideals of academic excellence that the university aims to achieve. 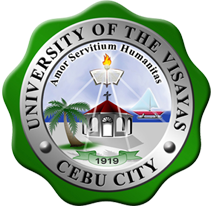 Bordering the circular shield are two circular lines in between which is the name, University of the Visayas and Cebu City, it’s main location. The equal distance between the two circular lines signifies the equality of educational opportunities for all with proven competence regardless of socio-economic status, race or creed and the non-discriminatory policy of the university, insofar as faculty and students are concerned. The outer circle is bordered by the University colors of green and white in continuous series of rounded projections of green, alternating with white. © University of the Visayas. All Rights Reserved.